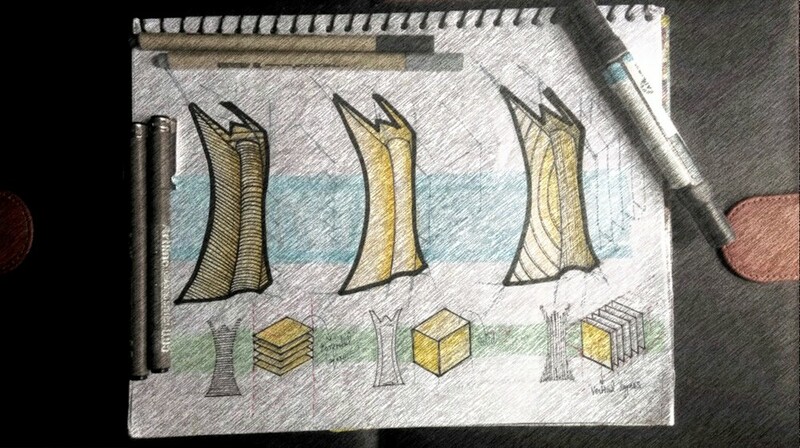 Trophy Design for WADe India: Scalable Design Systems by rat[LAB] - ArchitectureLive! ”Drawing curvilinear and natural forms brings in greater risks and responsibilities to drive ‘Elegance’ into the output. As a design studio, we take this quite seriously through a precise use of Design Technologies that can aid in creating design systems that can be deployed at various scales – be it a large skyscraper or a hand-held trophy.” says Sushant Verma, Design Head of rat[LAB] Studio, New Delhi, who co-created this vision along with his team of experts at the studio. WADe Asia is a platform created for the recognition and documentation of exemplary works produced by women in the field of design – art and architecture. As a part of WADe Awards 2017, rat[LAB] was commissioned to design a celebratory trophy that can abstractly represent womanhood and celebration that the award signifies. This was through a two-stage open competition floated by the organizers wherein the studio participated with their conceptual idea, later developed into a fabricated product in a short span of time. The trophy itself is conceived to be a celebration of women‘s contribution to the vast field of design and art, and recognize the top women designers with the award. The trophy design by rat[LAB] Studio embodies the team’s interest in contributing to the uplifting platform for Women Architects, Artists and Design Entrepreneurs in Asia. 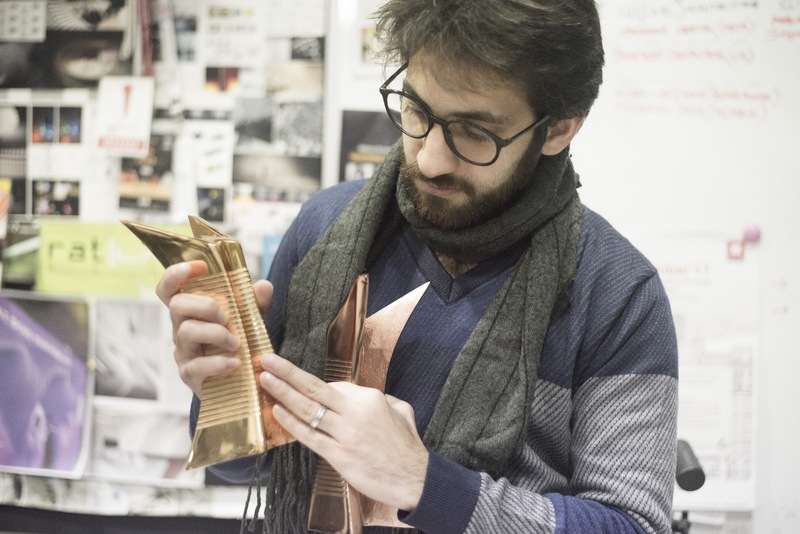 Scalability being the primary agenda of the studio, it is imperative that the trophy design should also incorporate scalability in its design process. Scalability refers to emulating the design process of one scale, say -architectural, to another scale, such as product design as the studio takes deep inspiration by the philosophy of UK based Industrial Designer and Architect Thomas Heatherwick who has often quoted “Products and Buildings are the same. Whether something is a Christmas card or a masterplan for a site that’s eight miles long, we’ve found it’s exactly the same process that you’re going through,” said Heatherwick in one of his famous interviews with Dezeen. 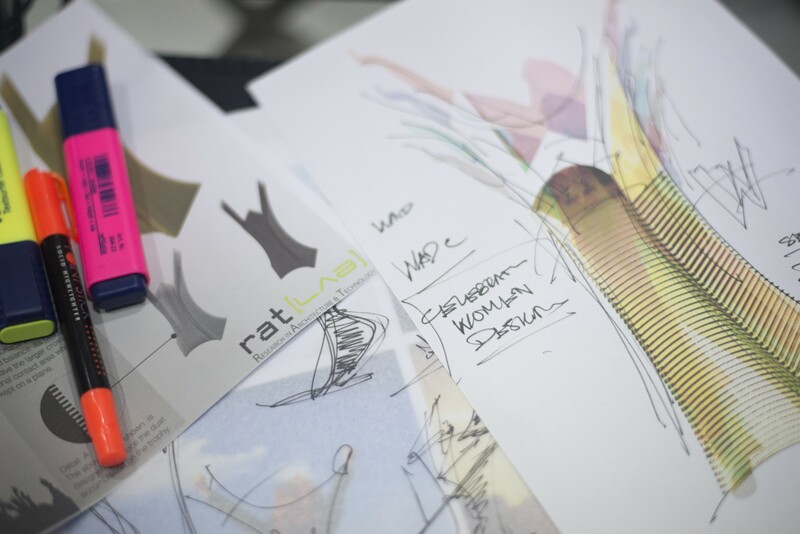 rat[LAB], as a studio, is frequently involved with design projects ranging across scale – from architecture, urban, interior design to art installations. Most of these projects are developed with the help of advanced computational design methods. Computational design allows designers to incorporate a rational and insightful approach to design. With little ingenuity, this process can be emulated at different scales with required modifications. With the idea of demonstrating scalability in the trophy design, the design studio adapted the design process from another on-going project of a skyscraper that the studio was involved in. 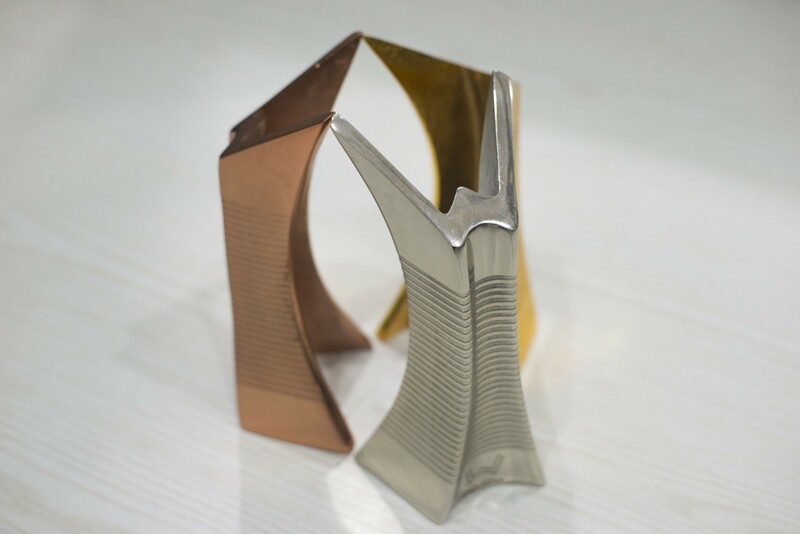 Just as the skyscraper design is based on a set of parameters, trophy is also designed keeping in mind some important parameters such as stability of the volume, materiality, ease of holding, weight, method of fabrication etc. The optimum form was developed after considering all the aforementioned factors. The whole process was streamlined by using computational design to make the design more rational and optimum. 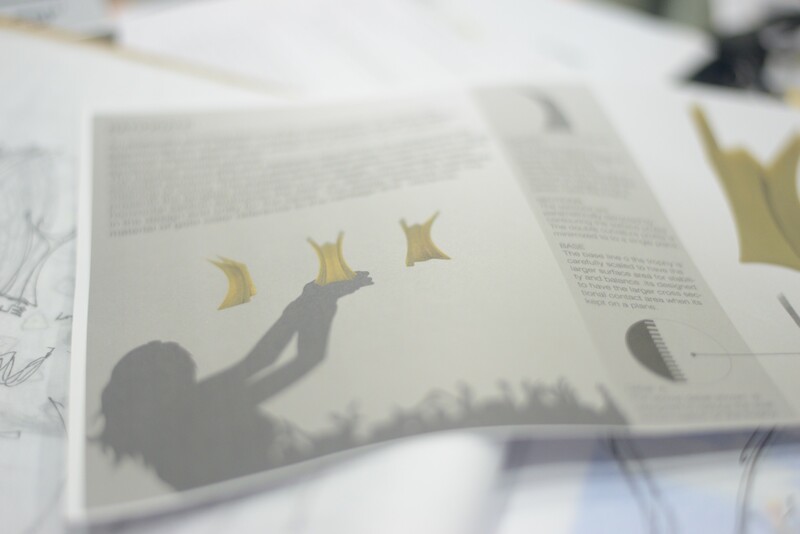 Fig: Design process using ‘W’ to represent Women in Design. 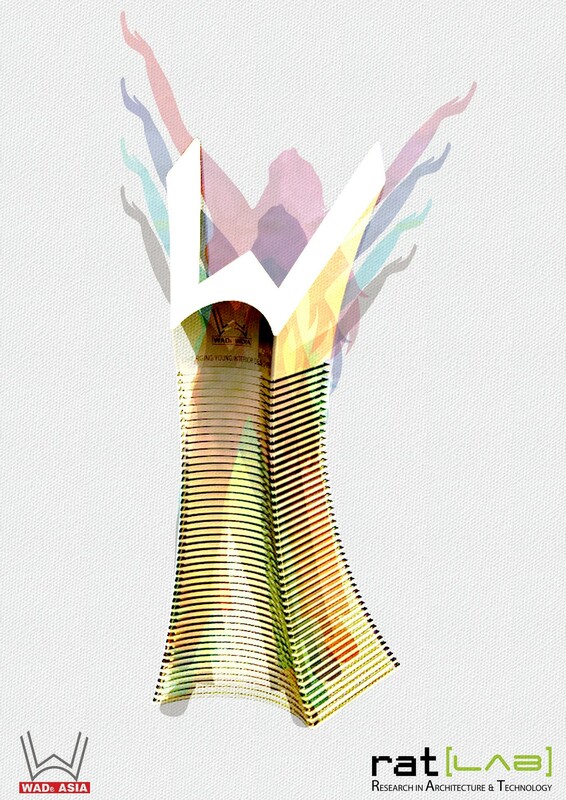 The form is ideated as a fluidic interpretation of the letter ‘W’ that sits as a miniature tower. The cross sections were subjected to parabolic curve to make the design more elegant and mathematically-controlled for fabrication process. The tips were extruded to give the form a triumphant look which was an abstract indication of victory. 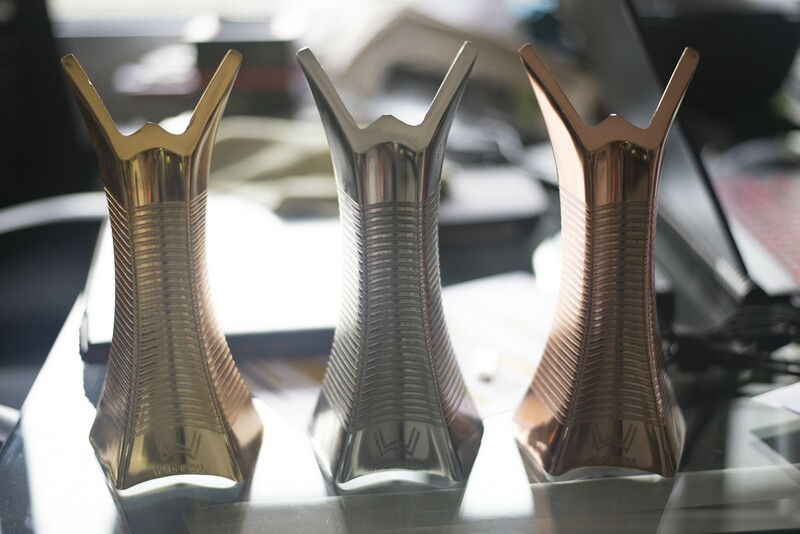 The trophy was created in three variations in gold, silver, bronze colour to denote hierarchy of merits, as per the brief. Using an Algorithmic Process, the geometry is subjected to an evolutionary process wherein the design can be evolved with each year of subsequent awards, if feasible for organizers. This allowed creation of a generation of forms for the trophy, all of which can be easily fabricated using conventional methods. This also ensured creation of multiple iterations, which could be evaluated against fabrication methods, time, costing, etc. to finalize the idea for WADe Award 2017. 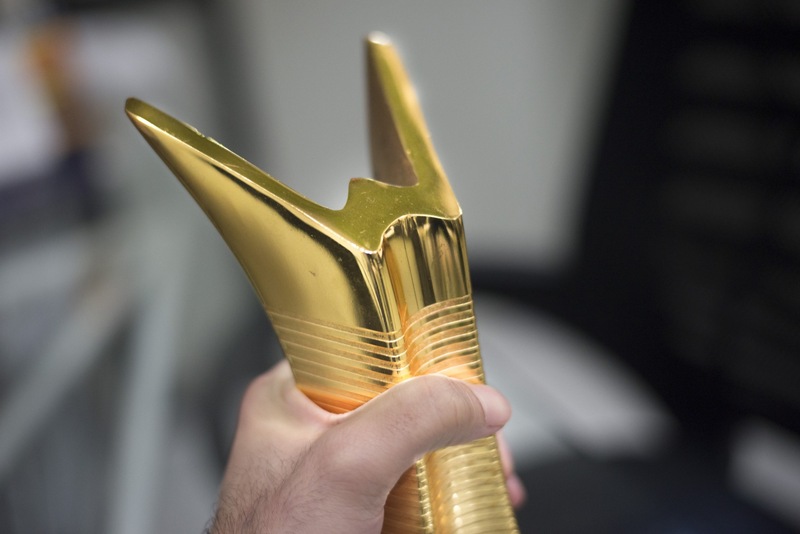 The stylized sectioning pattern seen in the trophy presents the tangible robustness in the design. Each horizontal section embraces the letter ‘w’ that demonstrates the solidarity in the design and unity for the cause and also enhances the letter ‘W’ which is synonymous with Women of WADe. The spatial balance is achieved by taking center of gravity into account. The mass and volume of the trophy is carefully designed to increase slenderness in the form and also be more comfortable to hold in hand. The mass is thoughtfully distributed between the upper and lower part to achieve an optimal division of weight which makes it easier to hold in hand and stable on its own, without any base support. The idea was to have a stand-alone and monolithic piece without any additional support, just as what the award recognizes. The sections are parametrically extracted by contouring the surface profile. The bottom base of the trophy is scaled up in two dimensions for more stability. It is designed to have a larger cross sectional contact area when it is kept on a plane. The parametric sectioning technique has also been used in various projects at different scales in the studio to create a fluidic language for larger spaces. To increase the grip of the trophy, horizontal grooves are introduced. The grooves are overlaid on the surface gracefully and break monotonous texture of the surface by giving a visual contouring effect. Fig:The form is subjected to parabolic curve for ease in holding. The wide base provides stability to the trophy. The fundamental design parameters are permuted to form an entirely new visual perception while maintaining the coherency of idea of the trophy. The trophy design was resolved more as a design problem than a mere object of art. Besides the elegance of form, beauty of proportions and harmony of idea, other factors such as ease of fabrication, material efficiency as well as cost of production were taken into account intrinsically into the design process. Final result is an artistically magnificent trophy with slender look that emanated opulence, confidence, meritocracy and women empowerment. The form is designed to create a feminine look that shatters patriarchy. Fabrication was very critical to the design process as there were tight constraints of time and resources. 3D printing was one of the methods tested to create moulds for a monolithic cast-iron piece for creating a robust trophy. Various methods of CNC cutting metal sections were also tested but casting was the finalized process owing to time constraints. The contour lines that form an integral part of design language, were engraved by hand on the solid form, to save time and cost, instead of piece by piece assembly as in the case of other sectioned elements designed in the studio previously. The most notable aspect of the minimalistic trophy design is the way complexities are exemplified in the design process through a simple execution to drive an elegant result. Computational design is defined as the usage of computer systems and algorithms to design. Computational Design allows ideation and testing of a large number of variations in small frame of time since they are based on parameters rather than mere geometric modeling. 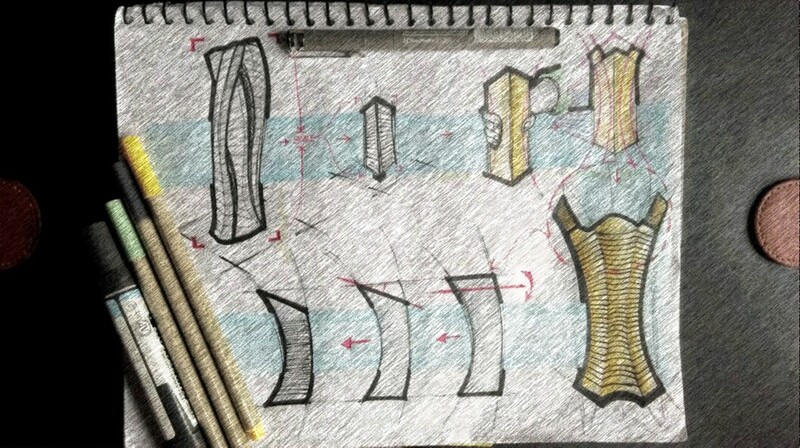 Parametric design process also helps in aftermath of design i.e. in fabrication or manufacturing. 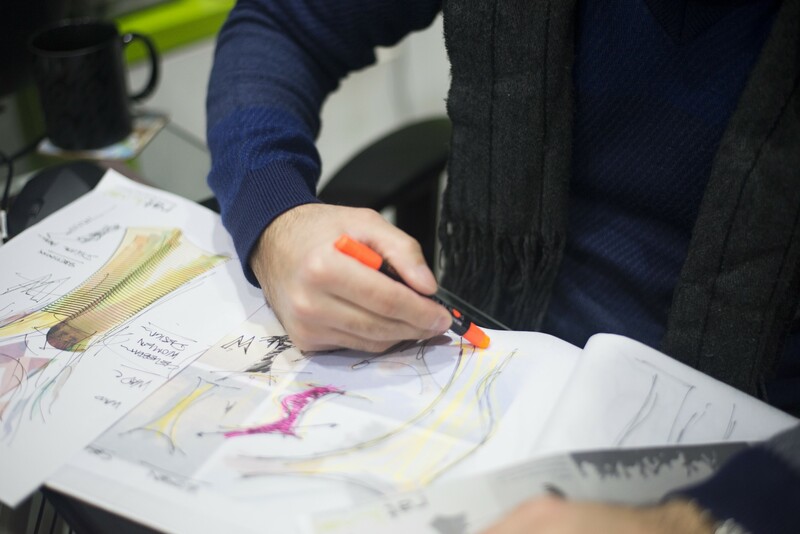 Fabrication or manufacturing data can be easily obtained from the design process, which in turn helps us determine the performance or efficiency of the design which reflects back in the design iteration decisions. Similar to any other design projects undertaken by the studio, the design of WADe Trophy is also designed using Computational Design methods. The whole design process, from conception to fabrication, computational design is a integral means. The software resources used in the computational design process for this project are Rhino3D and Grasshopper3D that allows NURBS based modeling and a parametric control of geometry, respectively. These are currently state-of-the-art tools that can be used by designers to create a multitude of scalable systems. Through the design of this trophy, rat[LAB] Studio has attempted to demonstrate two paradigmatic changes that are taking place in the global design industry – ‘scalability’ of design systems and a shift in ‘design tools’. The blend of two has led to an ‘elegant’ solution for a trophy design that has symbolized the award that WADe represents and acknowledges.